After offering PC and console players a taste of the earlier days when the SEGA Genesis and Super Nintendo were THE consoles to play, now it’s the Nintendo Switch’s turn to be taken over by this retro side scrolling beat ‘m up game. If you still own a SEGA Genesis, you could even buy this one for that console because Mega Cat Studios took the effort to create a cartridge specifically for the SEGA Genesis to enjoy this game in style. Now it’s time to look upon the Switch version of this classic brawler in which you defend the earth from aliens with, of course, Coffee! In Coffee Crisis, you’ll be playing as Nick or Ashley. Nick and Ashley are two rough baristas with a special love for coffee and won’t back down for a couple of aliens trying to take over the world. You can also play as both with a friend in co-op mode. 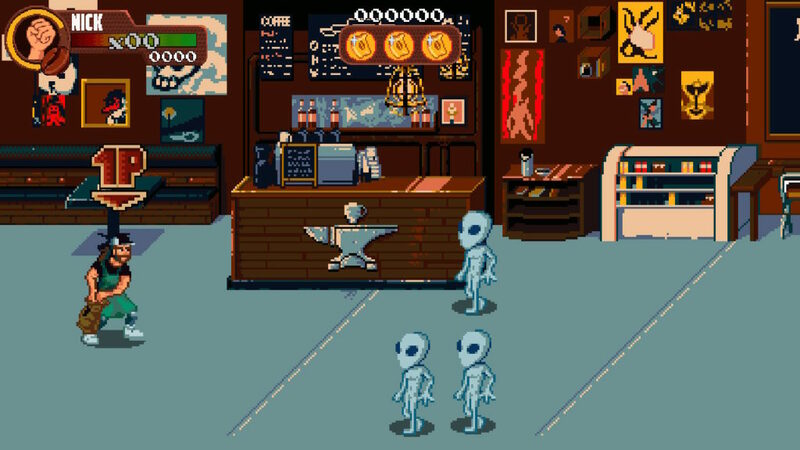 You’ll get dropped in the middle of an alien invasion when the game starts while your chosen character was working at the coffee shop. You will take up arms with a bag of beans to show those pesky aliens hell. You’ll get a short introduction to the alien commander and then, you’ll follow Nick and Ashley on their journey to save the world with their bags of beans and a badass attitude. The story of Coffee Crisis continues with cutscenes in-between levels when you’ve cleared them. 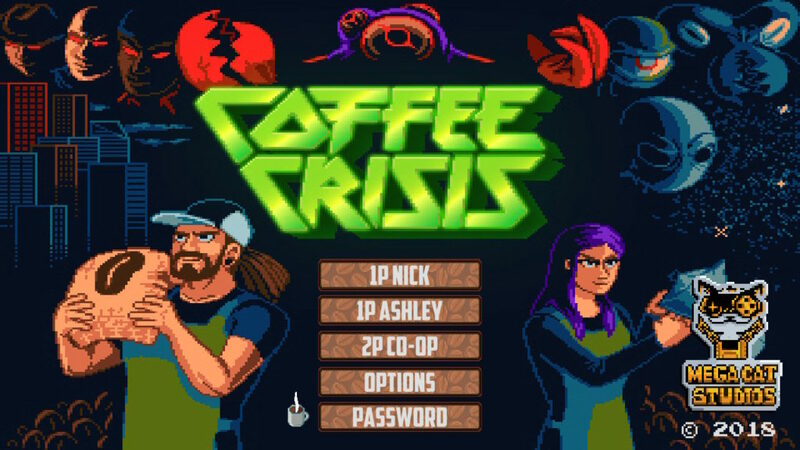 The graphics in Coffee Crisis look like they came from a game made in the prime time of the SEGA Genesis. It could’ve easily been created 25 years ago. If you’ve experienced that time, then the graphics will surely remind you of the good times when games were designed simply but good. Coffee Crisis is a flashback to the 16-bit graphics of that time. With the switch being a combination of a handheld and a console, this style of graphics doesn’t look bad on the screen at all. In levels, random filters will be applied to the screen, changing the appearance of each level. This gives each level a different look. The game is filled with metal music. From the theme song to being in-game, metal music is everywhere, and this just fits right. Beating up alien scum, possessed grannies and many other enemies while metal plays in the background appears to be a lot of fun! This music really encourages you to keep on playing and beating up more enemies. With twelve professional metal tracks, the music won’t bore you that fast. The music changes when you get at certain points or when things will get rough. The music adapts very well, and this just gives the game a little boost. 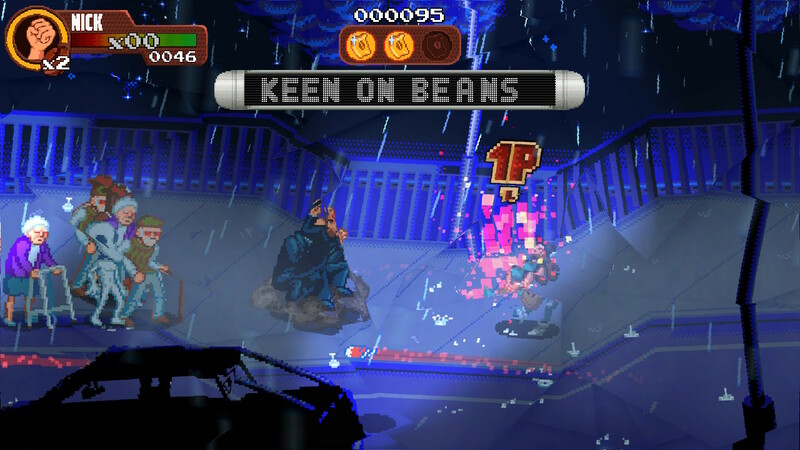 Coffee Crisis is a side-scrolling brawler. It’s a game comparable with games like the old Final Fight series and the Streets of Rage games. You will move on through each level by walking right. Enemies will come at you to try and stop you from reaching the end of each level. 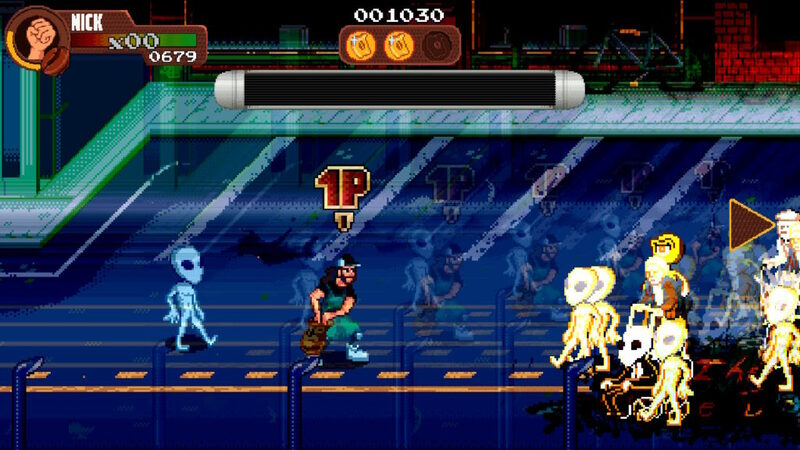 Each level is filled with alien creatures and possessed humans. You’ll need to be ruthless and spare no one to reach your goal, not even the harmless-seeming elders. When you first start the game, you’ll need to beat up a few enemies without getting any introduction to the game’s mechanics. After this, you’ll get some tips on how to play the game. The controls of Coffee Crisis are fairly simple as there are not many different controls and when playing in handheld mode, multiple buttons have the same purpose. This gives you the possibility to choose which buttons you prefer to use for each move. If you play with two players, each player gets a Joy-Con and the controls will stay easy to handle. The basic controls are a normal attack that you will use a lot, you can jump but you won’t use it that often, you can pick up weapons or enemies to throw them away and a special attack that uses a part of your coffee-meter that is also your health in this game. It can be really tempting to use this attack with Nick as it will knock away your enemies with a powerful spinning attack but you need to be careful using it too much because your health will be burned up a lot. The combat can be very tough as you will be interrupted by every attack that lands on you, while your opponents will almost never be interrupted when the same is done to them. When there are a lot of enemies in the screen, they will all simultaneously attack you and it will be very hard to land your attacks. Playing with two players makes this a bit easier. During each level, breakable objects and defeated enemies can leave items behind that can give you a temporary boost like invincibility or you will deal more damage to your enemies for a short while. These items can come in handy when it gets crowded with enemies. These items and the applied filters to the screen will add some variety to the game. Minigames can be found as items dropped by enemies or found by breaking items on the road. These offer you a chance to earn an extra life. These short games involve a lot of buttons bashing to clear. Like other comparable games in this genre, you’ll progress in each level by walking to the right until you reach a designated area where you’ll need to defeat some waves of enemies. When they’re defeated, an arrow will appear, meaning that you can continue. Normally, in this type of game, you’ll need to beat every enemy you’ll encounter, even the ones you encounter when continuing to the next fighting area. In Coffee Crisis, it’s possible to walk past all the enemies you cross paths with to avoid fighting them. This adds a little more freedom to the game, and that feels quite nice. Besides this, there’s not much of variation in the gameplay of Coffee Crisis. Each level is built up in the same way as you’ll start in the far left zone of each level and you’ll need to reach the end of this level by clearing your way through all the enemies. If you’ve finished the final battle in each level, a portal will open that will let you progress to the next level with a cutscene in-between levels. 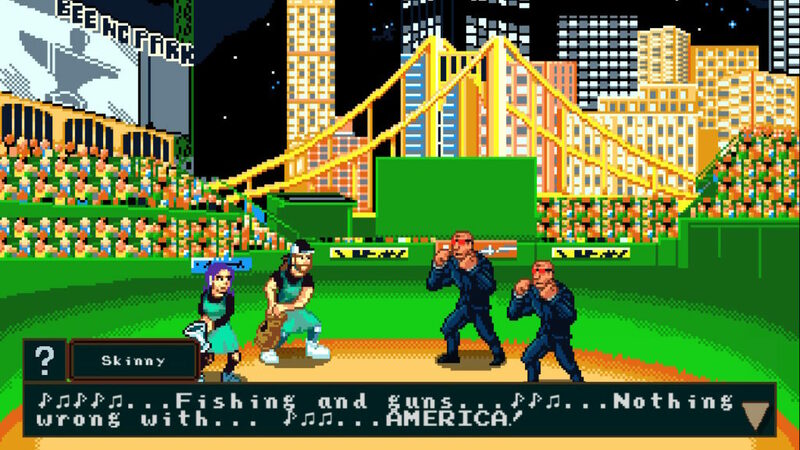 Coffee Crisis is a great way to relive the time when the SEGA Genesis ruled the gaming industry. It plays exactly like other comparable brawlers from that time and is really fun to play in single player mode and even more in co-op mode. The metal music combined with the old school gameplay offers a terrific nostalgic experience in a rocking way. Beating up aliens and possessed grannies with walking racks while listening to some awesome metal tracks can be really fun, even if you normally don’t like that kind of music. Surely the gameplay isn’t the most expansive we’ve played but you can easily spend some time alone or with friends trying to clear your way through the bit weird but fun story Coffee Crisis offers. If you’d like to relive the old days or just want to beat up some enemies with a bag of coffee beans, this game offers the perfect nostalgic experience with a new twist.